As a bit of background information, OmniOutliner documents in a DEVONthink macOS database display the contents of the documents with Quick Look and are also recognized as an OO document, where the Open With command will open the selected document in OO. With DEVONthink to Go, the contents of an OO document cannot be displayed as on iOS OO apparently does not include a Quick Look viewer. Don’t know if that’s an Omni thing or an iOS thing, but that is not important to this request. Additionally, DEVONthink does not recognize the OO document as belonging to OO so the user cannot do anything with the document outside of sending it somewhere with the Share extension. 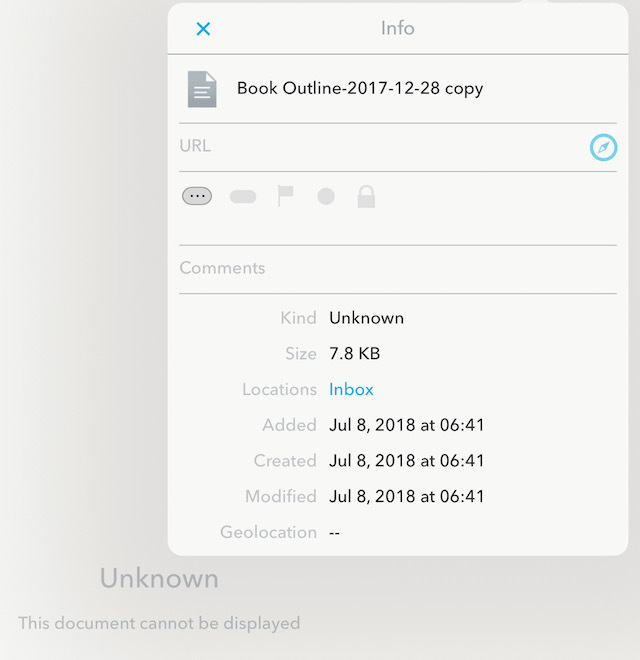 The iOS Files.app handles things differently, and while it also cannot Quick Look the document, it does recognize it as belonging to OO, even displays the correct document icon. When I click on an OO document in Files.app, it opens the document in OO which works nicely. As a result, the best way that I have found to open OO documents in a DEVONthink to Go database is to browse the database with Files.app and open it there. I would really like to eliminate the need for Files.app to accomplish this. Would it be possible to add this functionality to DEVONthink to Go, where it recognizes the document as an OO document, and clicking on the document opens it in OO, same as how it works using the Files.app? Man, if this is technically feasible and practical to implement, I’d love to see this for OO files, and other files that DEVONthink doesn’t natively support (or heck any file the user chooses!). It would really be a game-changer. 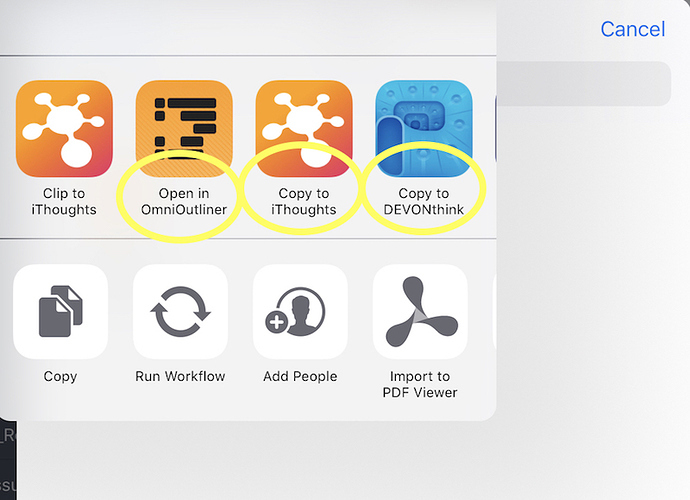 As far as we currently know it is not possible to ask other apps, like Omni Outliner, to open a specific file from within DEVONthink To Go; on iOS it only works the other way round. Files.app is, of course, a different beast as it’s Apple’s app and it can, of course, do things DEVONthink To Go can’t do. 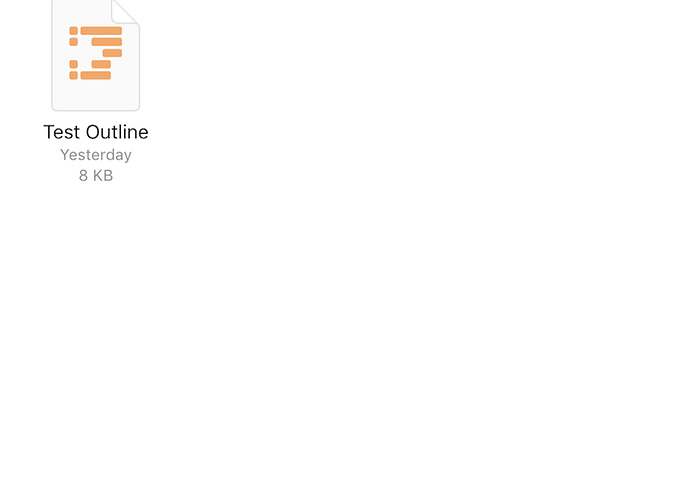 For example, Omni Outliner provides the document icon to the Files.app via the file provider extension. We don’t receive that so the only thing we can do is grab a copy of the icon and handle it all inside DEVONthink To Go. As Jim often points out here, iOS is not macOS. Unfortunately, especially where it comes to file and document handling. The icon is of secondary importance, but DEVONthink to Go is not displaying the icon of OmniOutliner documents for me. More importantly, would it be possible for you to look at Readdle’s Documents.app and see what they are doing with OmniOutliner documents? 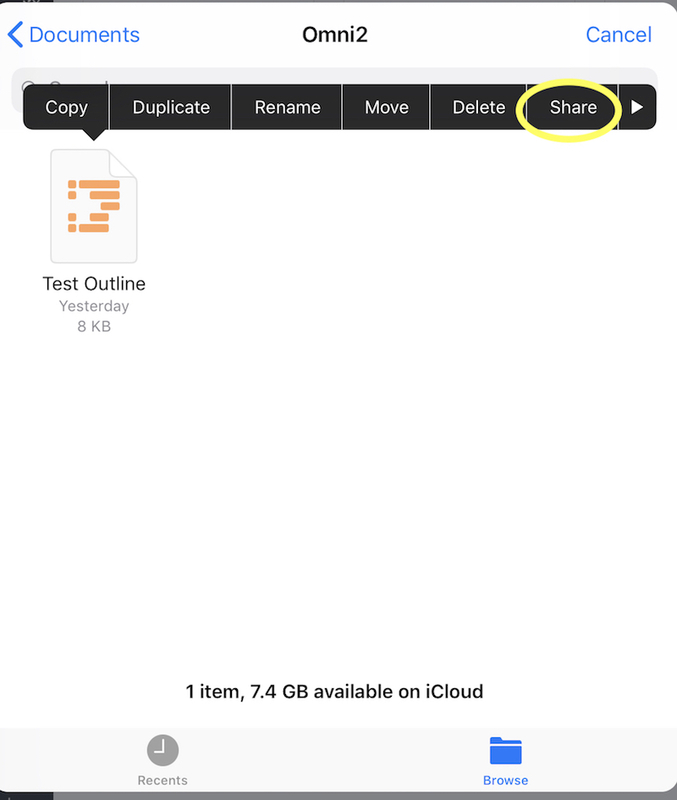 It’s not as elegant as what the Files.app is doing, but it does provide a way to open the document rather than just copying the document using the share extension. 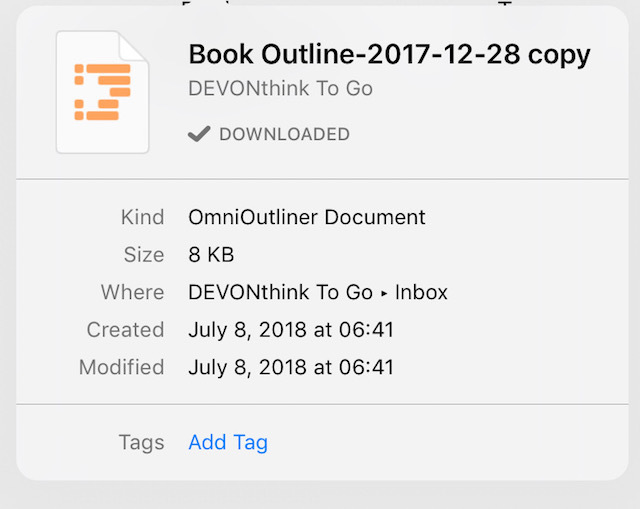 With Documents.app, the standard Share option (invoked by clicking on the box with an up-arrow icon) includes Copy to OmniOutliner, which is also the case with DEVONthink to Go. However, a long press on the OmniOutliner document brings up the black menu bar (sorry, I don’t know the correct term for this) and now the Share option in that menu has changed to Open in OmniOutliner. 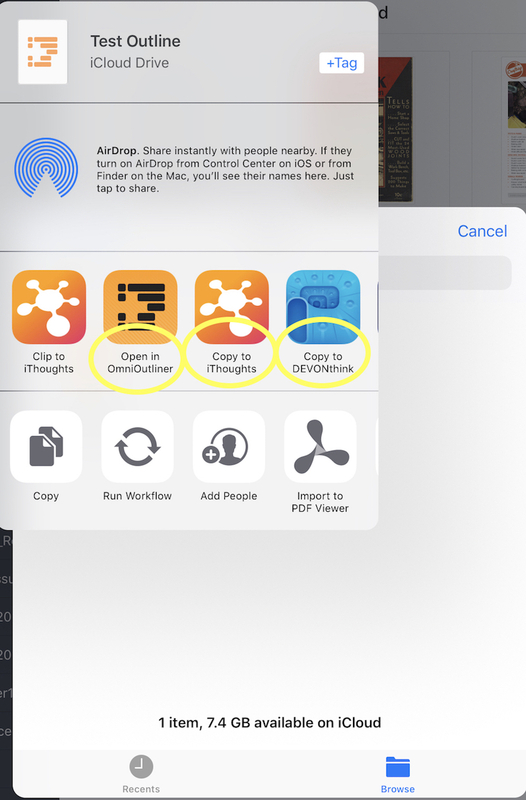 All the other options remain Copy to… so it would appear that the Documents.app is making a determination that the document is associated with the OmniOutliner.app. If DEVONthink to Go could do this as well, it would be a big improvement. The images below show the menu and menu option from Documents.app. Bumping this in case Eric missed my follow-up question? The whole sharing/opening mechanims on iOS is highly convoluted I must admit. We’ll have a look at what we can do and what (supposedly) Documents is doing differently. my workflow on Mac is that I create a daily log as an OmniOutliner file, using a DT template to set the name to the current date. obviously, it would be highly beneficial, to say the least, to be able to access those on iPad from DT2G, too - including the static preview we see on Mac.